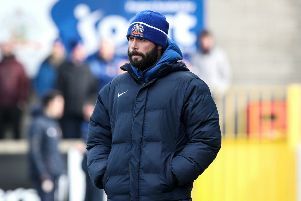 Glenavon will not be ‘playing out the season’ following last week’s win which rubber stamped their place in the top six. Manager Gary Hamilton wants to beat last season’s final tally of 51 points, his team are currently just three off that on 48. “There will be no letting up,” declared Hamilton. “Every team I have been involved with I have always gone out to seek a win, be it in the league, cup or a friendly. I have told the players I expect the same from them. If anyone does not apply that attitude then they will be dropped. Before the split, two games remain, away to Cliftonville on Saturday and home to Linfield on March 28. “We had a great result on our last visit to Solitude last August when we came from 3-1 down to earn a point,” said Hamilton. “They are fighting with Portadown for that third spot and with Joe Gormley up front we know it will be a big test for us on Saturday. The Triangle Supporters Club bus to Cliftonville leaves Mourneview Park at 1.30pm and Moira at 1.45pm.